Farrar, Straus and Giroux, 9780374210120, 320pp. “My feeling for Mike is something out of the ordi - nary,” Michael Frank overhears his aunt telling his mother when he is a boy of eight. “It’s stronger than I am. I cannot explain it . . . I love him beyond life itself.” With this indelible bit of eavesdropping, we fall into the spellbinding world of The Mighty Franks. The family is uncommonly close: Michael’s childless Auntie Hankie and Uncle Irving, glamorous Hollywood screenwriters, are doubly related— Hankie is his father’s sister, and Irving is his mother’s brother. The two families live near each other in Laurel Canyon. In this strangely intertwined world, even the author’s grandmothers—who dislike each other—share a nearby apartment. Strangest of all is the way Auntie Hankie, with her extravagant personality, comes to bend the wider family to her will. Talented, mercurial, and lavish with her love, she divides Michael from his parents and his two younger brothers as she takes charge of his education, guiding him to the right books to read (Proust, not Zola), the right painters to admire (Matisse, not Pollock), the right architectural styles to embrace (period, not modern—or mo-derne, as she pronounces the word, with palpable disdain). She trains his mind and his eye—until that eye begins to see on its own. When this “son” Hankie longs for grows up and begins to turn away from her, her moods darken, and a series of shattering scenes compel Michael to reconstruct both himself and his family narrative as he tries to reconcile the woman he once adored with the troubled figure he discovers her to be. In its portrayal of this fascinating, singularly polarizing figure, the boy in her thrall, and the man that boy becomes, The Mighty Franks will speak to any reader who has ever struggled to find an independent voice amid the turbulence of family life. 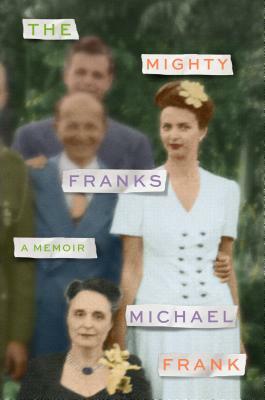 Michael Frank was a Los Angeles Times book critic for nearly ten years, and his short stories and essays have been widely anthologized. His fiction has been presented at Symphony Space’s Selected Shorts: A Celebration of the Short Story, and his travel writing has been collected in Italy: The Best Travel Writing from The New York Times. He lives in New York City and Liguria, Italy.